Just hours from Australia’s northern capital Darwin, Kakadu National Park is a wonderland of wildlife, waterfalls and gorges that delights every lucky visitor. In Australia’s most diverse territory, where sunsets are bold, wildlife is rich, and people are friendly, lies Kakadu National Park. 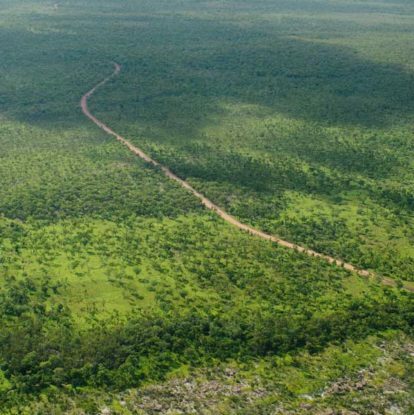 Kakadu National Park’s lush, green expanse is staggering. Home to a third of Australia’s bird species and the formidable estuarine crocodile, Kakadu (pronounced kak-a-doo) is the ultimate vacation destination for nature- and wildlife-lovers. But it’s so much more than that. Its cultural significance to all Australians is immeasurable. Far from the madding city crowds, the Northern Territory has a reputation for being remote, and Kakadu even more so. Yet it’s a myth that’s quickly quashed by its relative ease of access. There are various ways to experience Kakadu in all its glory, from taking advantage of one of the many small-group tours that ply the lush wetlands like AAT Kings to private guided 4WD safaris with the likes of Lords Kakadu and Arnhem Land Safaris or Kakadu Cultural Tours, that give access to more remote locations. Then there’s self-driving, offering the freedom to choose your own itinerary. Tours range from one-day jaunts out of Darwin, giving more time-challenged visitors a quick overview of the headlining attractions, to more expansive five-day explorations that allow the luxury of a deeper immersion. These longer itineraries showcase wondrous locations and abundant wildlife, from wallabies and crocodiles to bandicoots and water buffaloes, not to mention the mind boggling array of birds that dwell here. Glamping at Bamurru Plains in a safari bungalow. Image via Archie Sartracom. Spending a little longer there also affords the chance to take advantage of some spectacular accommodation, including Bamurru Plains, an eco-conscious safari-style lodge located in the heart of the wilderness. Its small scale – there are just 10 tent-style bungalows and a central lodge – allows it to tread lightly on the environment on which it sits, at the edge of the floodplains. Wildman Wilderness lodge, on the fringe of Kakadu in the Mary River wetlands, similarly boasts a central lodge and safari-style luxury tents, as well as cabins. And Lords Kakadu and Arnhem Land Safaris has its own private camp in the middle of the national park made up of permanent tents with floors, beds, solar lights and fans for the exclusive use if its guests. One of the highlights of visiting Kakadu is the awe-inspiring falls. Recognized on the UNESCO World Heritage List for both its natural and cultural significance, Kakadu is a classic wish-list destination for Australians and international visitors that is usually combined with a visit to either Mary River and Katherine (or both). Rolling out of Darwin, Australia’s northernmost capital city, it takes me just three hours to reach Cooinda Lodge and Camping Grounds. I immediately make my way to one of the two resort pools to cool off in. It’s surprising how easy it is to reach Cooinda, at the center of all the park’s attractions, accessible via a paved highway. In the pitch black of night, I fall asleep listening to a cacophony of insect calls in the nearby trees. My first full day in Kakadu is an assault on the senses. The morning heat kisses my shoulders as I drive the orange-dirt, 4WD-only road to Maguk Waterfall, one of the park’s star attractions and an hour south-west of Cooinda. Ruby-red dragonflies buzz past my ears as I begin the 1.2 mile return Maguk Walk. A monsoon forest embraces me as I draw closer to a freshwater plunge pool. Surrounded by sheer rock walls, the green-tinged Maguk pool is beautiful and after a float, I picnic at its edge. The morning quickly disappears as I enjoy my first adventure. When late afternoon rolls around, I set off to visit one of the most popular attractions in Kakadu, Yellow Water Billabong. A shuttle bus collects me from the lodge and drops me at the bank of the billabong for a two-hour sunset tour with Indigenous-owned Yellow Water Cruises. I join American couples and families eager to catch a glimpse of a crocodile, the larger, more aggressive cousin of the American alligator. As we travel along the calm billabong and into the South Alligator River, we spot a handful of crocodiles. Some are slowly cruising through the water with only snouts and spines visible; others are resting, mouths agape, on the muddy shore. Kakadu National Park is teeming with wildlife, including the magestic jabiru. Although they’re impressive, I’m more enamored with the birdlife. Darters perch on tree branches, wings outstretched as they show off their jet-black feathers; black-necked storks (also known as jabiru) catch our attention with their yellow eyes, red legs and long, azure necks; a juvenile jacana (Jesus bird) steals our hearts as it walks among lily pads. The sun is strong the next day when I arrive at Ubirr, famous for its Indigenous rock-art gallery. Setting off into the native scrub on the circular trail, it’s not long before I’m gazing up at walls of rock rendered with rudimentary illustrations depicting life hundreds – if not thousands – of years ago. Some artwork is difficult to decipher, while others are intricate and impressively clear. I identify turtles, fish and a thylacine, the extinct Tasmanian tiger, thousands of miles from its most recent habitat on Australia’s southern island state. Further along, I scale steps worn into the rock to a lookout, and I am dumbstruck by the sheer majesty of the 360-degree views. The lime-green Nadab floodplain stretches to the horizon; huge piles of crumbling rocks resemble decaying stone temples; the sky is blue and large, and the Northern Territory sun beats down. It is hard not to be silenced by the sheer beauty. The following morning, I rise with the sun to scale the mountainside track that leads to the top of Gunlom Falls (two hours from Cooinda). Having heard about a nirvana of tiered pools, I am determined to see them. The climb is steep and slow in the heat of the day, but after 40 or so minutes I arrive at the pools with their wide-reaching views of the park. Swimming at Gunlom Plunge Pool is an absolute must when visiting Kakadu. Only a handful of swimmers are about, but soon I am left alone for a quiet dip in the still water. Just when I think I couldn’t be more impressed by Kakadu, I meet Jim Jim Falls. It’s a full-day excursion, starting with a two-hour drive along a dusty road, followed by a walk through thick forest and over large, slippery boulders. My efforts are rewarded when I arrive at one of the most impressive natural environments in Australia, with stone walls on three sides. In the wet season (November-April) the best way to see Jim Jim Falls is by helicopter, when water thunders over the ancient rocks and mist swirls. But that’s for next time; Kakadu has captivated my heart, you see, and I will be back. Kakadu National Park is open year-round, however the best time to go is during the dry season (May-October), when most roads are open and it’s safer to swim. The best way to get there is by flying into Darwin International Airport and then joining a tour. The drive into the park takes about three hours, while travel times depend on road conditions throughout the park; allow a half day for each major attraction. Kakadu National Park is Australia’s largest terrestrial national park at 7646 square miles; the Bowali Visitor Centre near the main township of Jabiru is 155 miles from Darwin. If you’re self-driving, make Bowali Visitor Centre your first stop, as you can pick up maps and talk to rangers about which roads and attractions are open. Although Kakadu has Crocodile Management Zones, where rangers trap and remove the reptiles, travelers should always be cautious when swimming in pools. Pack light, breathable clothing as days and nights can be hot and sticky. Also take a sun hat, sunscreen and a reusable water bottle. To get to Kakadu you will need to pass through the Northern Territory’s capital Darwin, check out our ultimate guide to Darwin.